Windows 10 Anniversary updates has been released by Microsoft and because of many new interesting features which Microsoft incorporated inside the update, it is being downloaded by millions around the world and this is causing update issues for some users. 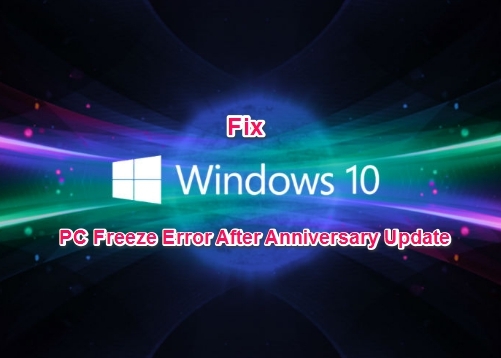 Microsoft has officially acknowledged the problem and released a fix for Windows 10 Anniversary update freeze error in its recent blog post. Here we have explained the official Microsoft workaround for fixing Windows 10 Anniversary update freezing issues that many are experiencing on desktop, laptop and tablets. If you have recently updated or installed Windows 10 Anniversary Update and have encountered update freezing for a long time then see instructions below to fix the problem. Microsoft has released official statement in which it accepted that the update freezing problem is in fact grappling quite a few users but fell short of expounding as to what exactly is causing the issue. However, the company also issued a temporary solution to get rid of the Windows 10 Anniversary update error. On a positive note, this update freeze issue is only limited to a few PCs. So, if you have been among those unfortunate ones whose Anniversary update freezes repeatedly then see the fix below. Microsoft has received a small number of reports of Windows 10 freezing after installing the Anniversary update on systems with the operating system stored on a solid-state drive (SSD) and apps and data stored on a seperate drive. This issue does not occur when starting Windows 10 in Safe Mode. Here is the solution for Windows 10 freeze on PCs after anniversary update installation where the Windows 10 is installed on a separate Solid-State-Drive SSD and apps and data stored an a separate drive. Basically this fix takes the PC back to the previously working Windows 10 version before you installed the anniversary update. As soon as permanent fix becomes available, we will get to known about it here first. Post comments regarding Windows 10 anniversary update problems that you are facing and we will do our best to come up with easy solutions for you, so stay tuned for that.